Tens of thousands of protesters gathered on the front lawn at Parliament Hill on Tuesday to support Canada's Tamil community and speak out against violence in Sri Lanka. RCMP Cpl. Caroline Poulin estimated that the crowd swelled to between 30,000 and 33,000 people at its peak, as families, students, children and seniors bused into the area from as far away as Toronto and Montreal. From early morning until late afternoon, the demonstrators beat drums, chanted, marched and waved flags as they demanded that the Canadian government intervene in Sri Lanka's long civil war. For 16 days, Tamil supporters from Ottawa and other cities have held demonstrations in the capital, but Tuesday's was by far the largest. 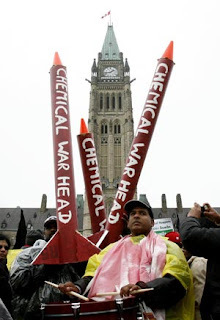 Protester Prabha Sinna said the Tamil community is increasingly frustrated that the Canadian government does not appear to be trying to push for an end to the civil war, which has left, by some estimates, more than 70,000 people dead over the past 26 years. "This is not the Canada that I understood. This is definitely not the Canada that I understood," Sinna said. The Tamil Tigers have been fighting since 1983 for an independent state for the country's Tamil minority, who say they have suffered decades of marginalization at the hands of governments dominated by the Sinhalese majority. The Tamil Tigers issued a statement on Tuesday stating that a "bloodbath" prevails in a sliver of land in the north of the country that is still considered Tamil territory. 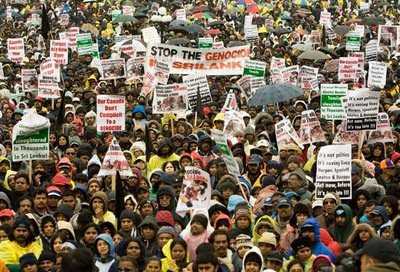 The Tamils say Sri Lankan military raiding the area killed about 1,000 civilians on Monday alone, and injured 2,000. But government forces say they rescued thousands of trapped civilians who the Tamils were using as human shields to guard against the advancing military. Tamil supporters in Canada decided to use this week to stage their protest because Parliament is now in session after a two-week recess. The Tamil Tigers are officially banned in Canada since the Conservative government listed the rebel group — known formally as the Liberation Tigers of Tamil Eelam (LTTE) — as a terrorist organization in 2006 for its reported use of suicide bombers and child soldiers during the civil war. Highways leading into Ottawa were choked early Tuesday morning with buses and cars bringing demonstrators to Parliament Hill. In the afternoon, roads were just as busy. Yodan Kumar, who was at the demonstration in Ottawa, said 45 busloads of supporters had left Toronto Tuesday morning. Kumar said his mother was killed in Sri Lanka last week. "I have about 30 people killed in my family, including my mother, sister and brother. And my sister was raped and killed," said Kumar. "That's why I'm here." Keerthana Kaneshalingam, 12, arrived in Ottawa with her mother and sister from Toronto on Tuesday morning at 4 a.m.
"They're killing. We don't want to let that happen. That's why we came here," said Kaneshalingam. By 10 a.m., the protesters who were lined up behind the barricades on Wellington Street began to make their way closer to Parliament Hill. Shortly after, police estimated that around 6,000 protesters had already joined the demonstration. Although the Canadian government has said it won't speak with a group that flies the flag of the Tamil Tigers, some members of Parliament commented vocally on the protest. Canada's the largest expatriate community [of Tamils] in the world," said NDP Leader Jack Layton. "We should be taking the lead in calling for a ceasefire. We should be much stronger in the action that we're taking." Liberal foreign affairs critic Bob Rae said the situation is dire. "A blood bath is a distinct possibility and we have a responsibility to make sure that doesn't happen," he said. "There's no reason why we shouldn't be engaged. We should roll up our sleeves and try to find a solution to this." But Foreign Affairs Minister Lawrence Cannon said the government has called for a ceasefire and demanded that the Sri Lankan government open a humanitarian corridor to allow civilians out of war-torn areas, and allow aid in. Protesters on the Hill Tuesday put away their red Tamil flags and instead carried Canadian flags and plain black ones in the hopes that the federal government would talk. Senthan Nada came from Toronto to join the black flag protest. "Black flag is to represent sorrow and to mourn for the people. Black is death," he said.